"Researchers found that only 0.5 percent of obese men and 0.8 percent of obese women were able to attain and maintain a normal body weight. They concluded that once an individual becomes obese, it is very difficult to return to a healthy body weight. Indeed, persistent dieters stuck in a pattern of weight cycling, or ‘yo-yo dieting’, might be altering their hormones and altering their sense of hunger, some research suggests. Furthermore, even if weight loss works, it is important to consider what kind of weight an individual is losing: fat loss decreases mortality but loss of lean muscle weight may have the opposite effect. And how is that weight being lost? A person could technically lose weight on a steady diet of pizza and french fries, but this would do little to improve overall health." This is in line with every study I have read regarding long-term weight loss. We're still in the dark ages on solutions that can be scaled. We rely on studies about how our ancestors ate or how people in foreign countries eat, because we can't run a large enough experiment here. To get enough data, we would need thousands of volunteers to stick to a diet for over a year. Scientists have not been able to do this, so we are forced to rely on preexisting data. This is far from ideal, which is why everything solution is up for debate, because the results are never strong. If we can't get people to stick with a diet even for a controlled study, then the thing that must be addressed isn't what diet is best or what exercise is best, the first problem to solve is how to get people to stick to any long-term changes regarding health. Scientists, along with regular people trying to get in shape believe, people have an innate ability to stick to any change, all they require is the right information. All science has proven is this idea is invalid. It's a self-contradicting utopian theory where we assume people can change at will. But if we lived in that utopia, why would weight be an issue in the first place? Telling people what diet or exercise (and any combination) is best is equivalent to telling a person who can't speak Chinese, what the best book in Chinese is. Yes that's nice to know but it is not practical, it does not apply. That is why I believe mindset and behavioral changes are the main priority. If that is not the first part of a fitness approach, everything else is a moot point. "The solution is not to reframe obesity as superfluous, but rather to seek a new approach to a decades-old problem. We need to focus on treating and preventing obesity, not only through intensive weight-loss regimes for individuals, but by attacking the root cause: the behaviours that are damaging to your health, no matter what your size. [J]ust because we do not have an effective way of maintaining long-term weight loss, does not mean we should pretend it is not a health goal. Ignoring obesity as a health risk is irresponsible – the psychological impacts of fat shaming and discrimination are profound, but health care professionals cannot deny a major medical issue because society is cruel. Recent findings suggest that more than one-third of obese Britons classify themselves as merely ‘overweight’. It helps no one – not the doctors, nor the patients, nor their families – when we allow people to delude themselves, and to redefine the relationship between weight and health. We may have reached a new normal, but that doesn’t change the optimum. On the other hand, reducing all of health to a mathematical formula of ‘weight over height squared’ is absurd. So where does that leave us? As a culture, we must embrace different body types and accept that a person’s weight and waist circumference are not a commentary on their worth. Governments and societies must address the social deficits that contribute to obesity – poverty, food deserts (districts with no ready access to fresh, healthy and affordable food) and lack of exercise spaces – to empower people to take care of their own health. In the long run, the medical community must find ways to help people stay healthy through lifestyle fixes, medical interventions, or both, regardless of their size." It is a very uphill battle, a lifetime battle, but it's still a battle worth fighting. We are coming to a point where body image acceptance is going to be a part of what it means to be civilized, that must be also paired with unhealthy lifestyle as risk factors. I have severely obese clients who come to me. Here is my approach, which is one always based on objective honesty. If they ask me, "Hey Sam, I am overweight, does that make me a bad person?" 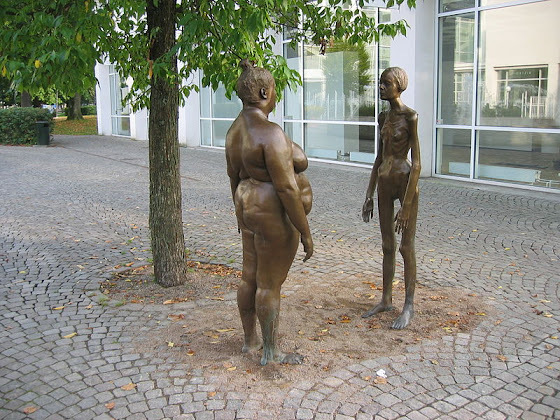 I would answer, "What does your weight have to do with morality or your worth? That question does not compute with me. That implies an irrational idea, that we can measure goodness then by our weight. To see how kind a person was, all they would need to do was step on the scale. I guess then courts could decide cases by literally having people stand on scales. Whoever weighed less wins. In other words, no it does not make you a bad person. It does not reflect anything about the quality of your being." If they ask me, "Do you think I should lose weight?" I would answer, "No. I don't care what you weigh or how you look. You're fine with me the way you are. I have no expectations of you. You came to me unhappy with the way you are but I can accept you as you are. If you want suggestions on how to become healthier, I can provide that. If you don't want that suggestion, that's fine with me too. If you want to be happy the way you are no longer want to make changes, that's fine with me too. In fact I can help you with that as well." This may sound odd, but I am not one of those coaches who has this sense of ownership over clients, or exert some authoritarian paternalism. That to me is absurd and irrational. I don't own you. Why would I care what you weigh? You are not my toy. You are another human being. My equal. If they ask me, "Do you think I am at an optimal weight for health"
I would answer, "No." If that was the truth. If they were of a optimal weight but were convinced they had to lose more weight, I would also be honest and say, "Yes you are at a optimal weight and there is no more weight to lose." This may mean I will lose a client, but that's the point. Every client should eventually graduate and leave, I should not be training them for the rest of their lives. Nor do I want to train them that long. If they ask me, "Do you think I should change my behavior?" I would answer, "No. I'm personally fine with your behavior. Feel free to live your life the way you please. No judgment from me." If they ask me, "Do you think I should change my behavior if I wanted to get to my optimal weight?" I would answer, "Yes that would be the logical thing to do based on your caveat." And that would also be an honest answer. If they ask me, "Can I have a cheat day?" I would answer, "A day you can eat whatever you want? You have free-will. Every day you can do that, and if you did do that, that is not a cheat. That is liberty. Cheating is acting dishonestly or unfairly in order to gain an advantage over another. How in the world did we begin to associate cheating with eating whatever we want? Eating whatever you want is not dishonest nor is it unfairly giving you any advantages. If anything it may give you a disadvantage in the eyes of society who constantly judge people's eating. "Cheating" is a term trainers came up with to guilt people into controlled behavior. And it has in its history never worked long-term. Even if I gave you a cheat day, it means I have control over your freedom, which is absurd. It also means you are giving permission to do something bad. That's like doing nothing wrong and having someone tell you, well what you did was wrong, but I'll let it go this time. It's patronizing and disrespectful and makes you feel like a bad person for nothing when you did nothing wrong in the first place, so why do you even need anyone's permission?" If they ask me, "Would eating whatever I wanted whenever I wanted be against my best interest of optimal health?" We don't need to shame or judge to help people. One of the secrets to my success has been treating clients as adults and as sentient beings (not robots meant to be controlled.) Trainers and scientists who think humans are like robots who can be controlled by a push of a button, are not being very scientific in their thinking.